I’ll address conventional and technologically doable energy, ignoring such things as bio-fuels and Moose power for the time. Believe me, in certain parts of Canada, residents would be very happy to harness Moose Energy if that would keep them off the roads. 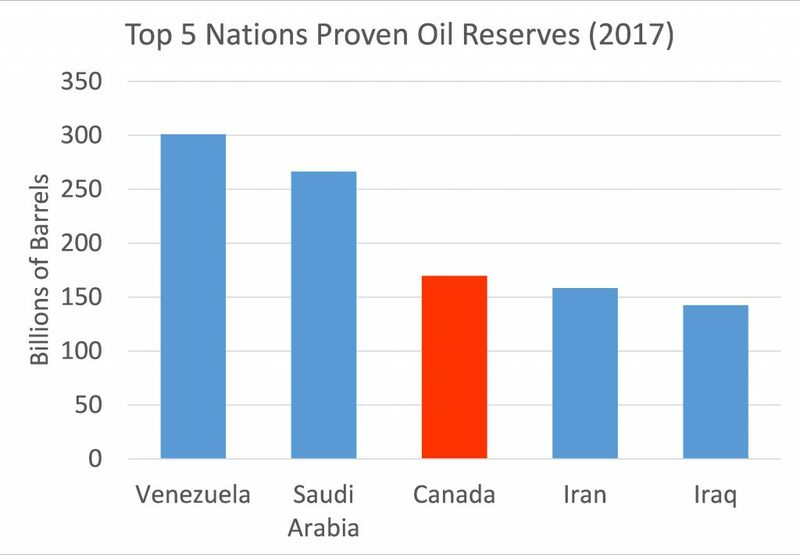 When various national and international agencies sum established, proven oil reserves, Canada invariably places at number three or four in the world, with CIA data reporting them at number three (see Fig. 1). Currently, Canada is the number four (4) crude oil producer in the world. Looking at the reserve values in Fig. 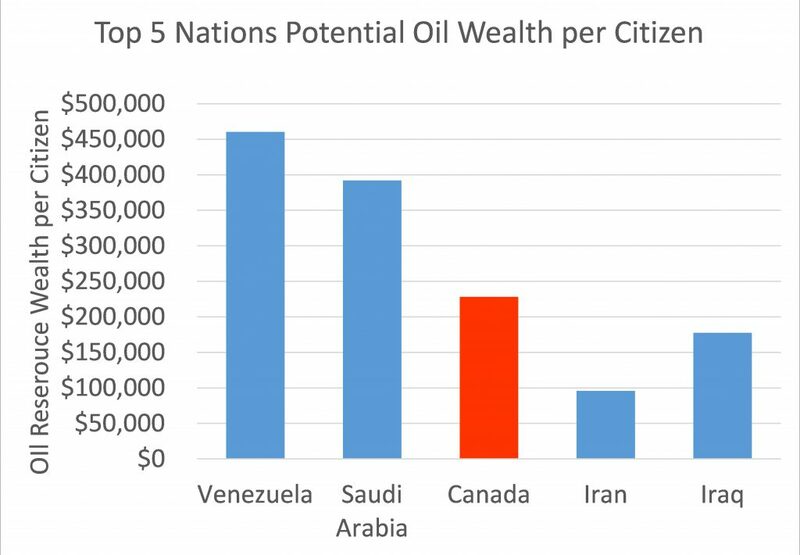 1 a bit differently assuming $50 US / bbl as a common market price, then in terms of potential oil wealth per citizen yields the values in Fig. 2. One can then understand why the Prime Minister of Canada in a speech in Houston in March of 2017 said that “No country would find 173 billion barrels of oil in the ground and just leave them there…”. It gets better. geology and advanced technology suggest that Canada has vastly more hydrocarbon reserves in the form of tight formations. If we add the tight shale oil reserves from just the province of Alberta and again calculate Canada’s potential oil wealth, then basically, every Canadian has close to $800,000 dollars (US) in the bank (ground) (Fig. 3). Canadians should be thankful. 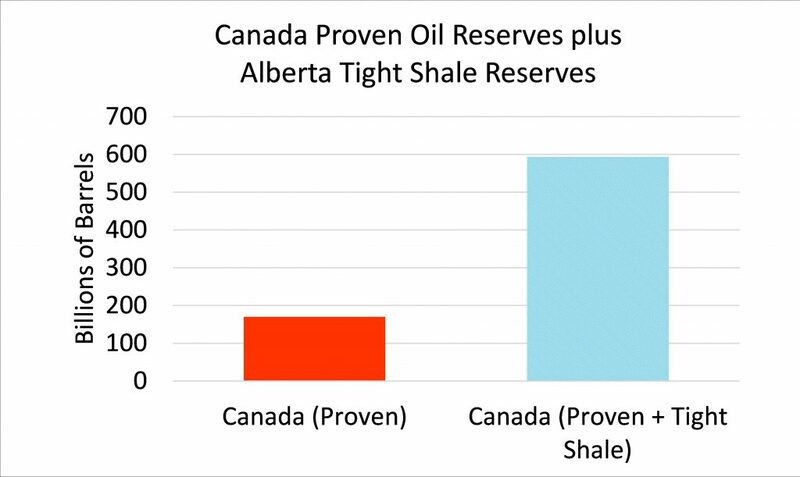 Note that almost all of Canada’s proven and tight shale reserves are onshore and the above figures do not include any Arctic Ocean reserves. The published reports and news stories are just the tip of the iceberg. Sharing in-person, old tech social chats with geologists and geophysicists in Canada reveals them to be almost giddy at the early indications of other untapped oil and gas reserves. The story with natural gas in Canada is similar. Canada is within the top five global producers and exporters of natural gas and both the proven reserves and tight shale reserves are huge. Canada is blessed by an overabundance of hydropower (Fig. 4) and is among the top ten producers of hydropower in the word. Canada even exports about 11% of its hydropower to the U.S.
About 60% of all of Canada’s domestic electric power demand is met with hydropower production. Looking at Fig. 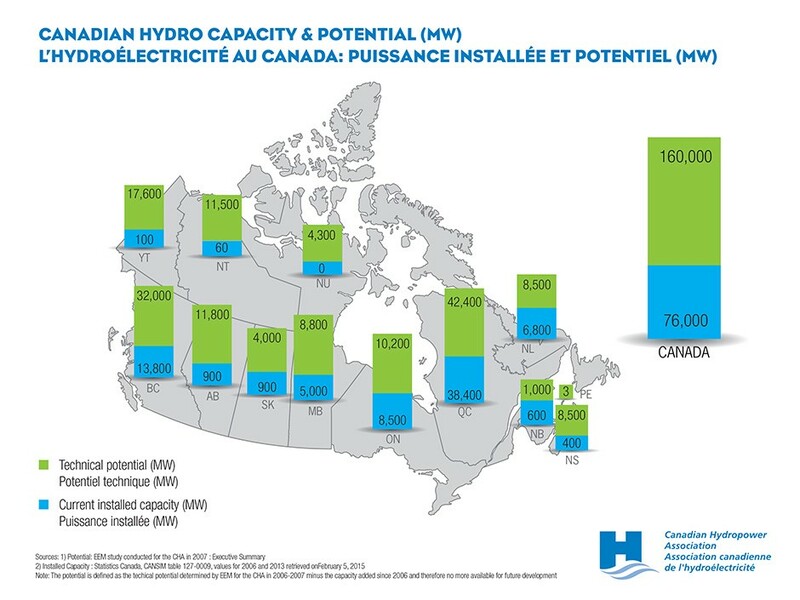 4 again suggests that if Canada decides to bring onstream more of its hydropower potential, it could easily meet all of its domestic electrical power demand and still have more leftover for export. Integrating electric cars and buses into the economy could be no problem for Canada. Wind energy supplies 30.5 TWh per year or about 5% of all electricity generation in Canada. 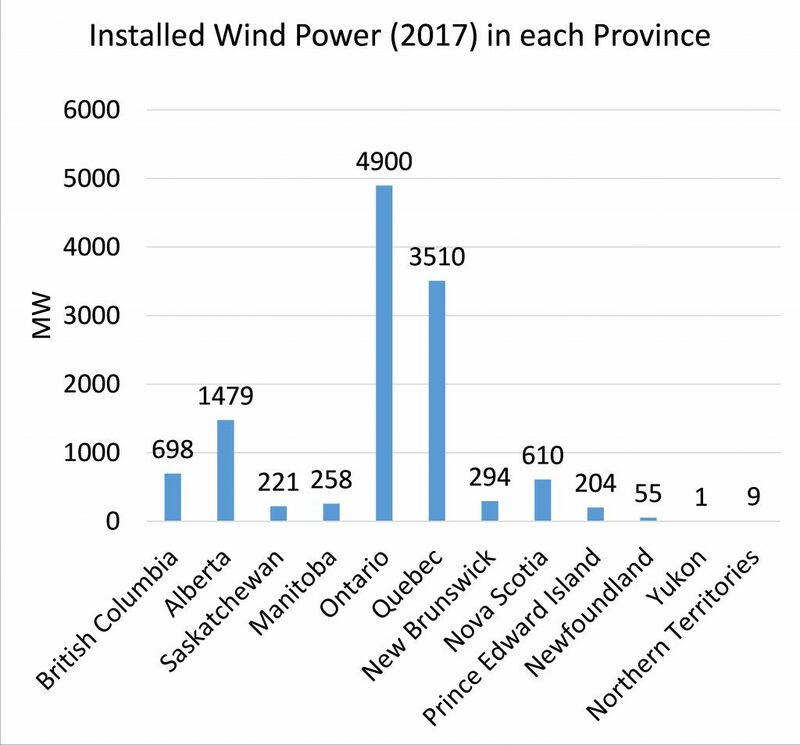 Most installed wind energy capacity is in Ontario and Quebec (Fig. 5). 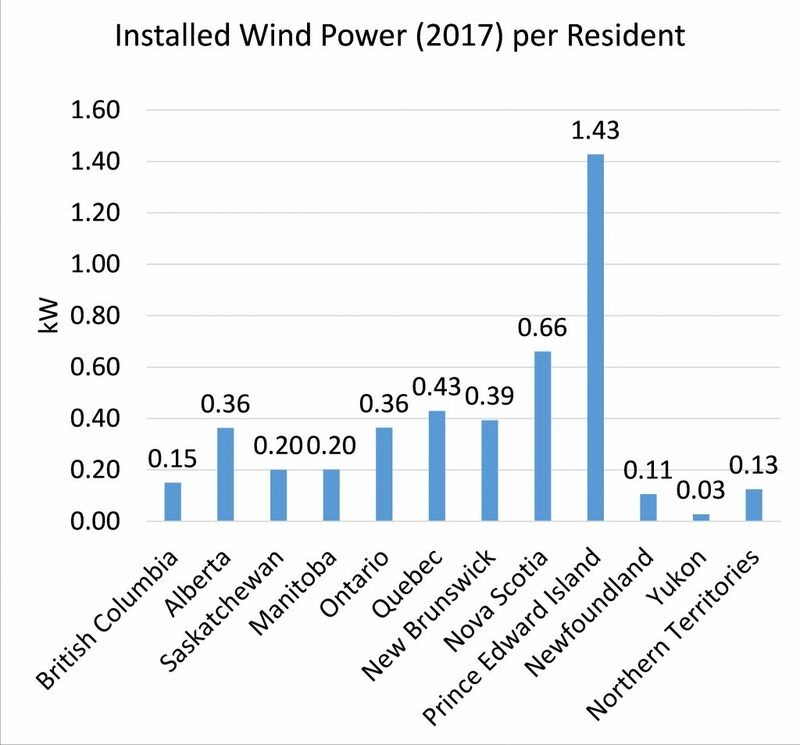 In terms of installed wind power by resident, Alberta and the Maritime provinces lead the way (Fig. 6). This is not just due to geography and prevailing wind conditions in those provinces, but also due to better politics (more about that in Part 2). Huge tidal power resources exist on all three coasts of Canada – Atlantic, Arctic and Pacific. On the East Coast, the Bay of Fundy has enough tidal energy to power every home in Nova Scotia (see GlobeandMail.com and Siam.org). Coupling tidal power with wind energy, and maybe a bit of other existing renewable energy technology, Nova Scotia could conceivably become completely energy independent from the rest of the world. Yet apart from one of the world’s largest tidal power stations in Nova Scotia, Canada’s ocean energy resources have not yet been tapped in any significant manner. 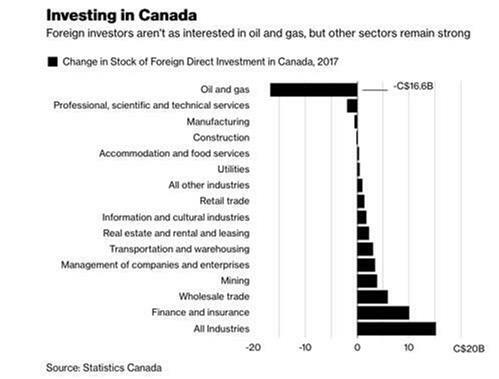 With all those vast energy resources, why does Canada still import oil from Saudi Arabia, why has foreign investment in Canada’s oil and gas industries fallen (Fig. 7, and Bloomberg) , and why do investors now consider Canada one of the riskier places in the world to invest in energy projects? It is because current energy policies in Canada are chaotic and lack a long term cohesive strategy and common vision. A few well connected politicians have a vision for Canada’s energy future, but that vision is not universally shared, does not adequately plan for undertaking and has no realistic means to be financed. Canada’s current energy policy is a mess that costs Canadians too much now and will result in unfathomable losses of future wealth. I am shocked that Canada still imports crude from Saudi. Always assumed that they were a net exporter. The government has to stop thinking Socialism, so the investment returns.